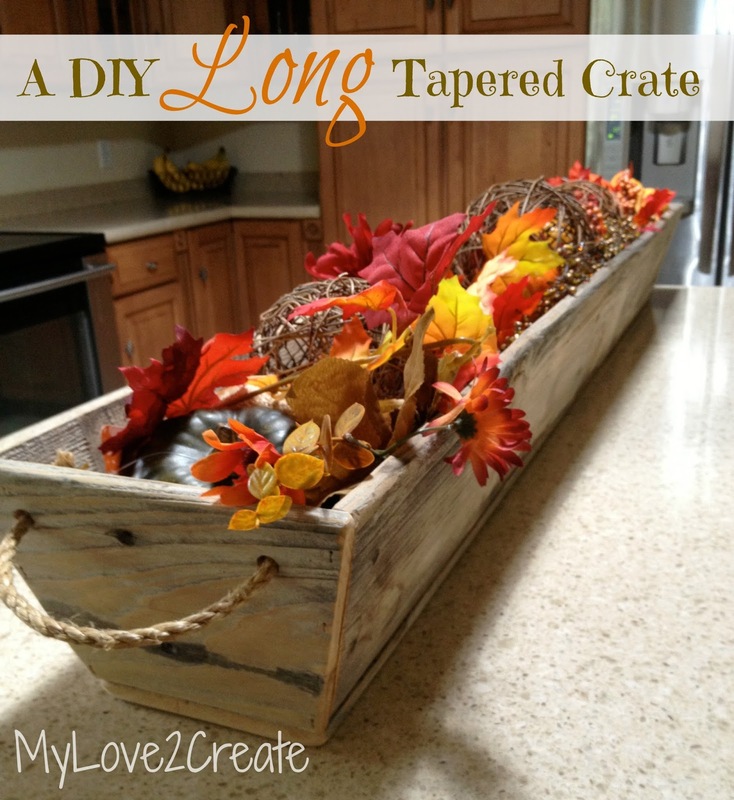 A long tapered crate and back to Blogging! 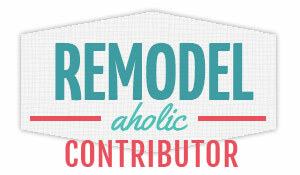 It is so good to be blogging! Our family had a great break from the media, it was a perfect way to end the summer! We are back in the swing of things with school going strong, and I have been one BUSY mama! Seriously, I have had zero time to blog this past week....I did start reading blogs again and can I just say, I missed you all. I love and admire all your awesomeness, your creativity makes me happy! So thanks to all those I follow! And a Big Thanks to all MY followers! I appreciate you being patient with me during all my hand issues and media breaks. I have started projects again I can't wait to finish and share them with you!! As for my hand....well it is weak sauce, but I am totally working on that! This Friday I will be 8 weeks out from date of injury and I can quit wearing my small hand brace, which I still wear during "risky" situations (running, driving, building, etc...). 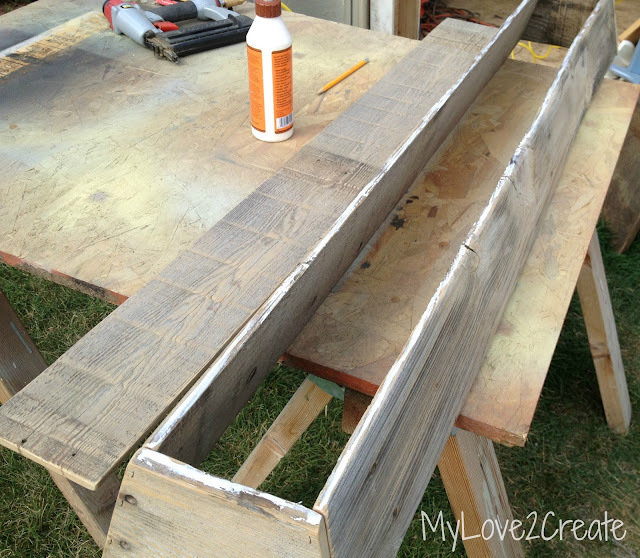 Today I am sharing a twist on a project you have seen before. 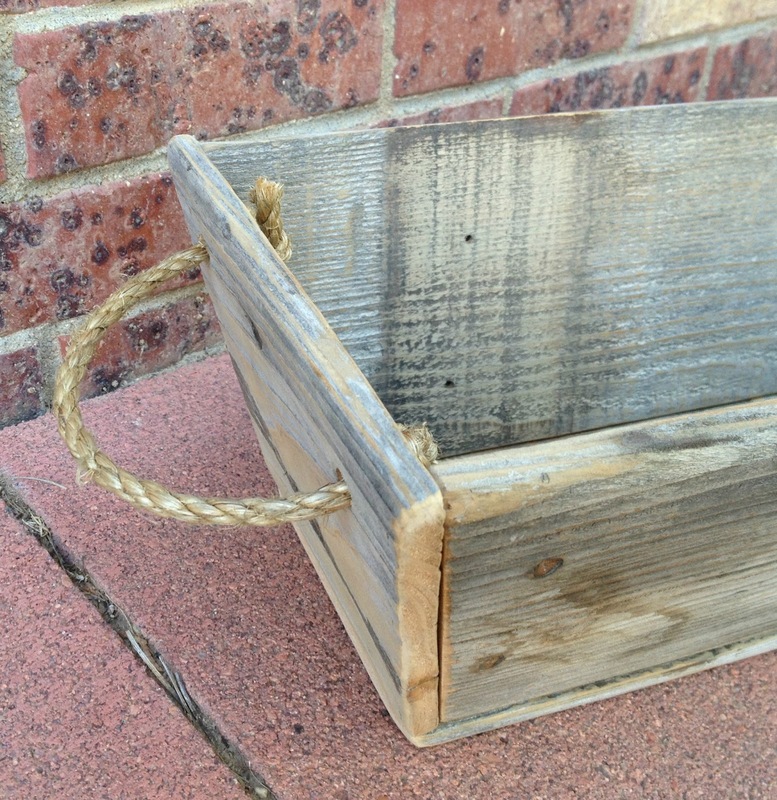 Remember my tapered crate? Well I modified Ana's plans to make a longer crate that will really make a big statement! 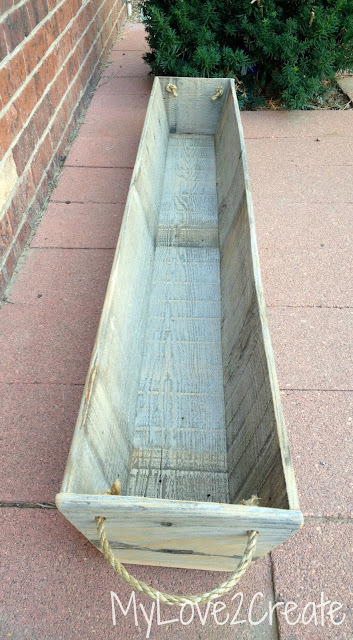 I got a tip from a friend about a stack of fence wood that was for free in the neighborhood. Did I want some? Heck yeah! The best part....most of the boards were screwed on! All I had to do was put my awesome drill in reverse and set to work. It was a good thing too, because a couple boards were only nailed on, I tried getting them off and my hand was not strong enough at all. I have get my strength back before I tackle that kind of job. I measured the width of my board and used that measurement (a little less than 5 1/2 inches) to cut the end pieces. I cut them 15 degrees off square, short point to short point. That means the bottom of the end pieces are a little less than 5 1/2 inches. For my long board I made it 4 feet (48 inches) short point to short point (again that is the bottom measurement) ends cut at 15 degrees off square. You could make it any length you want! After I cut all my boards I made sure to sand them really well and smoothed all the edges, we don't want splinters! Here is my bottom piece all cut and ready to be put on. 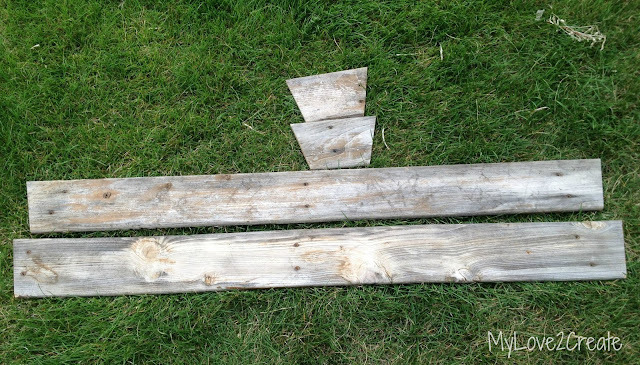 It was 48 inches as well, and I decided to cut the ends at 15 degrees off square to match the slope of the end pieces. Although, I don't know that it was necessary. It was simple to add glue and nail it on! Just remember to angle your nails so they are going into the board at the same angle, otherwise they will stick up in your crate. Also if you look at Ana's plan her bottom board was inset, I wanted mine sitting on the bottom so it added a little height. Finished! Well, almost. I just need to add some rope handles. I made a simple template for where I wanted the holes by grabbing some cardboard and hole punching the hole placement. I used a pencil to mark the center of each hole and then drilled a size just bigger than my rope and added the handles! Super cute! I can even hold the crate using both handles...barely =) it is super long! Look how cute it looks on it's side!! Kinda like a display crate. 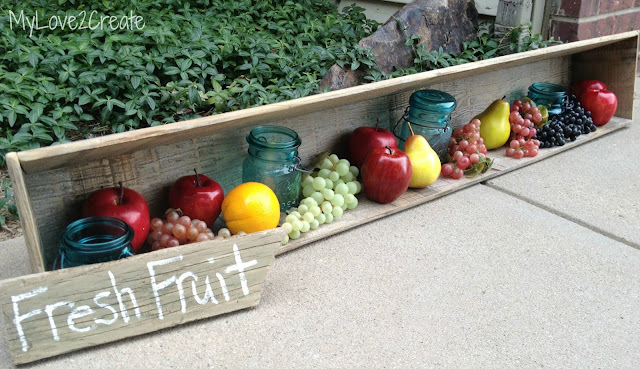 It makes all that fruit look nice and cosy! Just filling it with fun seasonal decorations. I am really loving the size, it adds a bit more character to any home decor. I guess I will have to make another one. You see this one is for a friend and she plans to use it on a large table, won't it look amazing! 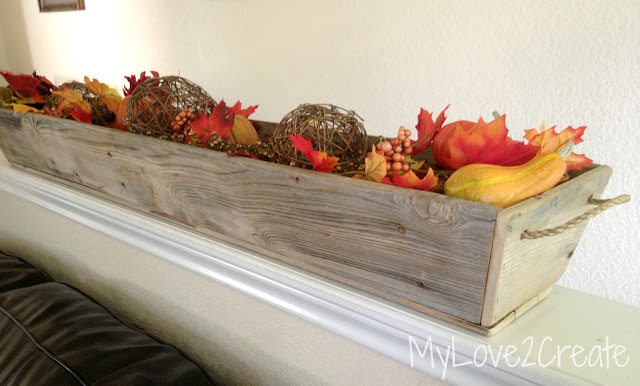 I am even tempted to make two and have them as planters on my porch, they would add such a nice touch. If you had a long tapered crate, what would you use it for? I will be linking to these parties. That is so nice! The extra work of cutting the 15 degree cuts was worth it. That taper gives it such a custom made look. 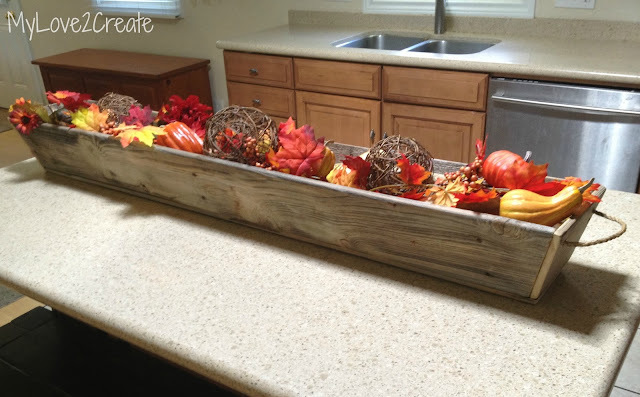 If I made one, I'd use it on the table with seasonal decorations. Take care. How beautiful - I need one of those!!! This would work so beautifully for every season - oh the ideas you've put in my head now! 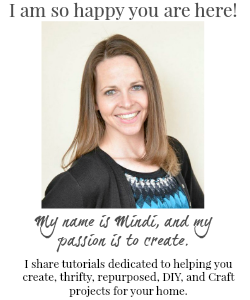 Glad to have you back, Mindi! 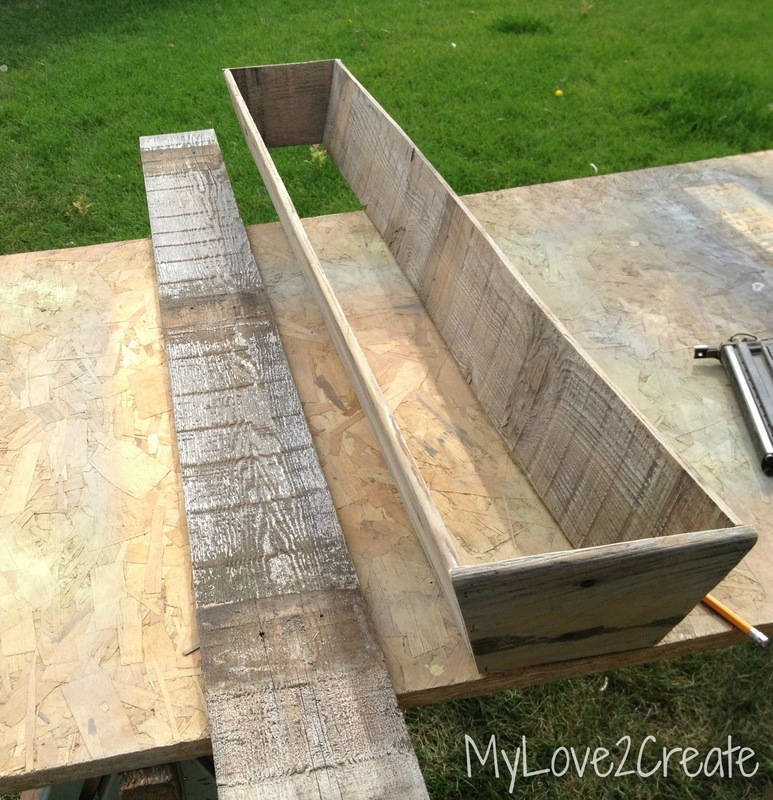 I love the crate, I made a similar one to have it in my kitchen, lined up with heavy plastic to plant herbs, it's still there on the window sill in my kitchen. Turned out totally awesome. You didn't say anything about sanding or dry brushing so am assuming you didn't have to. You found some great boards. Good to have you back in commission. Hope you squeeze in some physical therapy with that hand. Thanks so much! 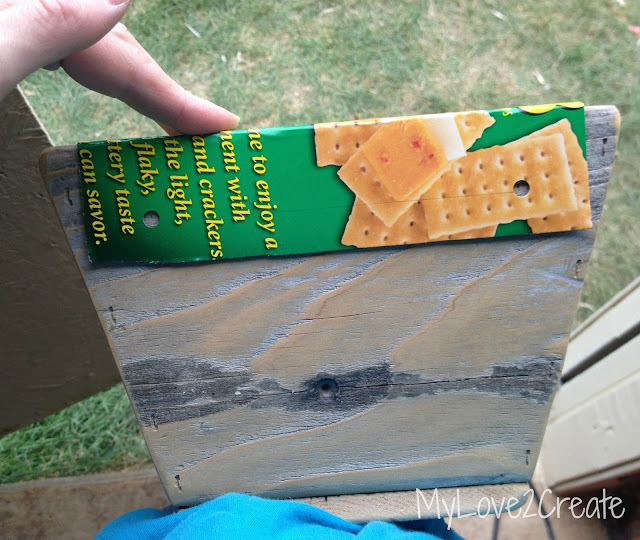 I just edited my post to add that I did sand my boards, really well! The wood color is naturally weathered, the best kind =) So no, I did not have to dry brush! I would use it just the way you are, on your ledge. It would be so pretty at Christmas with twinkle lights and an evergreen garland or sparkly ornaments! You're a genius! Using the cardboard as a template! I'm still the dummy who tries to measure and mark and ends up saying "screw it" and eyeballing it. I love it on the mantel! It makes me excited for fall! Pinning for sure. I love this!!! So lovely and decorative. I need something like this in my home as well. Stopping over from "The Gathering Spot". Following you on Bloglovin, Twitter, and GFC. WOW! This is Fantastic:) I certainly need one of these for my table,Great job! You did such a great job with this! It looks fabulous! If you like to link up come over to Craft Frenzy Friday at www.craftdictator.com! It goes live Thursdays at 7:00 PM Central! I hope to see you there! I love this, it looks great! I love these types of boxes/crates they work with any decor and you can so easily change them up for the seasons or your mood. Thanks for sharing. Your crate is amazing. 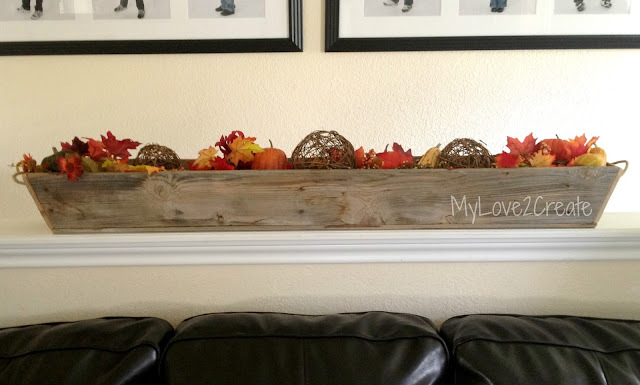 I love seeing how others repurpose items, I will reconsider those old fence posts I see for free in and around the neighborhood too. That looks gorgeous! If i had one I would fill it with little potted plants and use as a table centrepiece. L.O.V.E. I.T. Definitely going to try this!! Thanks for sharing. Hi Mindi, Missed you too!Thanks for sharing how to make this at @DearCreatives Glad your healing & hope to see you again soon! 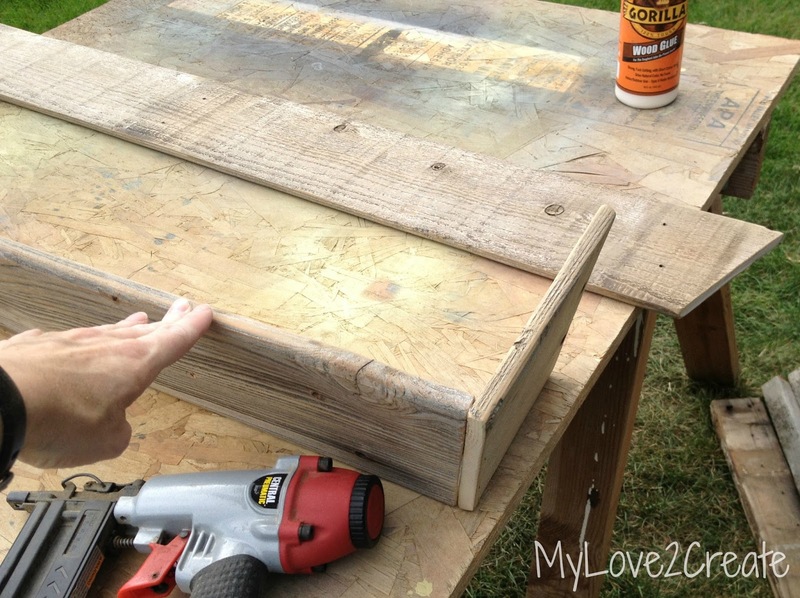 I am going to share this tweet tweet diy & pinning to my party page! sorry my autocorrect changed my Mindi to Mandy. Darn autocorrect! love it! pinned it! Gonna make it! Mindi, I love this! 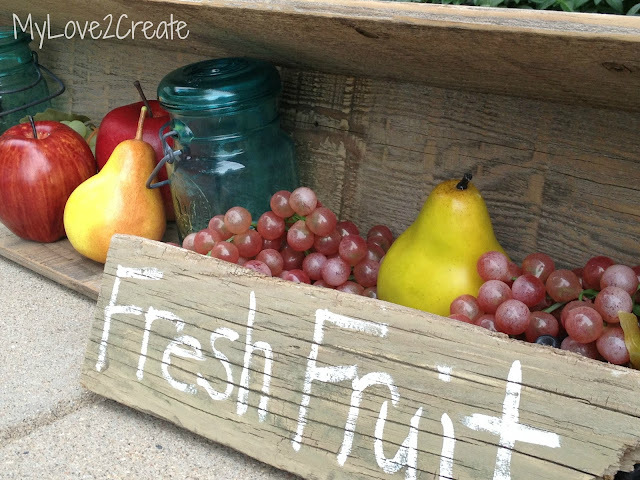 There are so many great decor ideas for this crate. Thanks for sharing at Throwback Thursday. This crate is awesome Mindi. I love the size. I am featuring it on my party tomorrow! loving this! 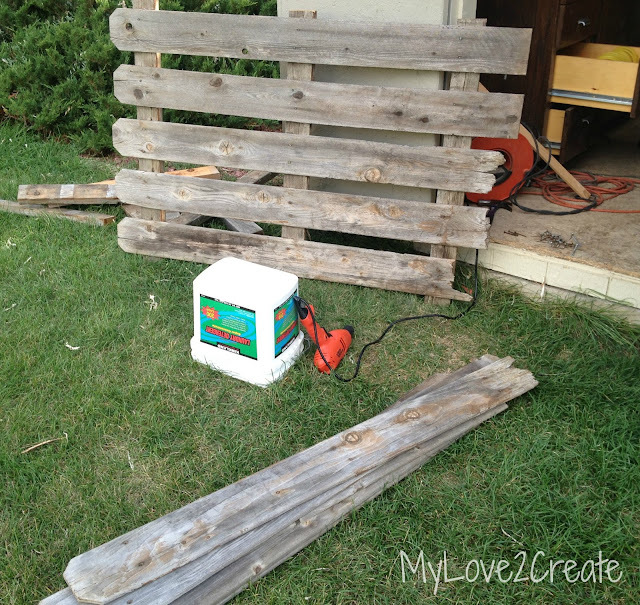 So creative and you put a different spin on pallet board DIY's.